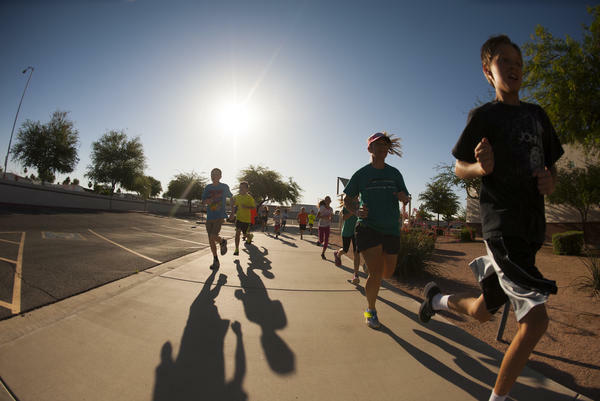 Mindy Przeor founded an after-school and summer running club in Mesa, Ariz.
Przeor says running doesn't cost a lot, "so it works in communities where there is not a lot of funding." Kaprice Faraci (left) and her twin sister, Kassidy, joined the run club in third grade after seeing kids jog by. "We were like, 'Hey, we wanna do that,' " Kaprice says. The club is about getting kids and parents to realize, " 'Hey, I can do this, too.' And building healthy habits together," says Przeor. "We saw some girls running around the school in the neighborhood and we were like, 'Hey, we wanna do that!' " Kaprice says. She's wearing a pink tank top with the words "Yeah I run like a girl, try to keep up!" "It took a lot of effort to start and push ourselves, but she was really encouraging and helped us gain more confidence to run a 5K race at the end of the season." 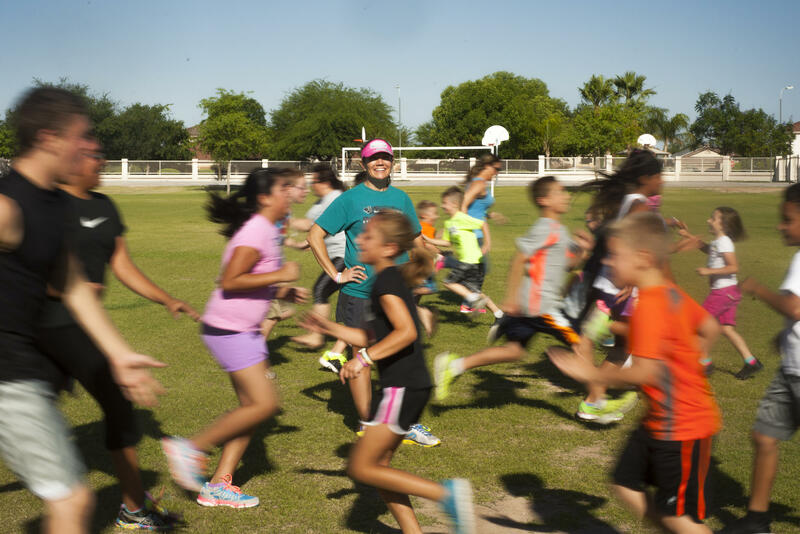 "She" is Brinton Elementary's phys ed teacher, Mindy Przeor, who founded this after-school and summer running club in Mesa, Ariz., because there were no after-school physical programs at the elementary level. There is a half hour of PE twice a week. But for many that isn't nearly enough exercise. Arizona has the nation's 7th highest obesity rate for children between 10 and 17 years of age. Przeor wants to help change that by promoting the link between exercise and learning. The marathoner and triathlete works to "awaken the body and get the body healthy" so her students are ready to learn. "Because sitting in a classroom for eight hours with no activity is not going to produce the results people want." Przeor tries to get parents involved, too, with the message that you don't have to be a certain body shape or fitness level to walk or jog lightly. "It's about getting them to realize, 'Hey, I can do this too.' And building healthy habits together," she says. Parent Marcy Soto agrees. Her son and daughter have been in the run club for four years. Soto says Przeor is "always pushing them, to reach for something they strive for." She adds that the club helps "keep them fit and healthy and that way they're not inside playing video games all the time. I want to make sure they are busy and active. No couch potatoes!" Since the early 1980s, childhood obesity in America has more than doubled in children and quadrupled in adolescents. And rates haven't gone down recently, they've only flat-lined: More than one third of all kids in the U.S. today are overweight or obese. One factor among many, public health experts agree, is kids aren't getting enough exercise at school. The Centers for Disease Control and Prevention reports that students are getting less and less gym time. First Lady Michelle Obama's Let's Move campaign highlights exercise as central to fighting the obesity crisis. The Brinton running club started with about 20 kids and it's been growing ever since. Third-grader Taylor Dugi and her 13-year-old stepbrother, Antonio Conner, are loyal members. "It sort of lets me let out my feelings and stuff," 8-year-old Taylor says. "After school I feel angry and it's on a Thursday so I just go to the running club. I just run and I feel like nobody is telling me what to do." On a recent morning, children from 4 to 14 gather at a Mesa high school track before 7 a.m. — and before the searing Arizona heat sets in. The club's summer program is in session. There's a warmup, a quarter-mile time trial, a mile run and grueling stair-climbing drills up and down the metal bleachers. The sprawling Mesa school district has a relatively high percentage of low-income children and nearly 60 percent of the children at Brinton get free or reduced-price lunch. So another part of Mindy Przeor's motivation is that running doesn't cost a lot. It can be done on your own, without a coach, she notes, and can teach more than physical skills. "Perseverance and setting goals, life skills you can gain from an activity like running," she says. "And you don't need a whole lot so it works in communities where there is not a lot of funding. Arizona has faced severe cuts in education funding, including deep trims for nonclassroom spending. Parents and teachers have protested, but voters have repeatedly refused to raise property taxes to help soften the blow. Principal Patricia Estes says that among all of Brinton Elementary's after-school programs, the run group "has had the most consistent attendance. It attracts and keeps kids coming back for more." Przeor knows that one after-school and summer club won't change the state's obesity rate. But she's now collaborating with other elementary schools to organize run events. She's slowly building an elementary school running revolution in Arizona — one run club and one race at a time. Childhood obesity has long been a problem in this country. Rates of obesity have more than doubled in American children over the last three decades. Lately those rates have plateaued but haven't gone down. More than one-third of all kids in the U.S. today remain overweight or obese. One factor - they don't get enough exercise at school. NPR's Eric Westervelt tells us about a phys ed teacher in Arizona who is doing something about that. ERIC WESTERVELT, BYLINE: First rule of Brinton Elementary School run club - keep those legs moving. MINDY PRZEOR: Go, go, go. 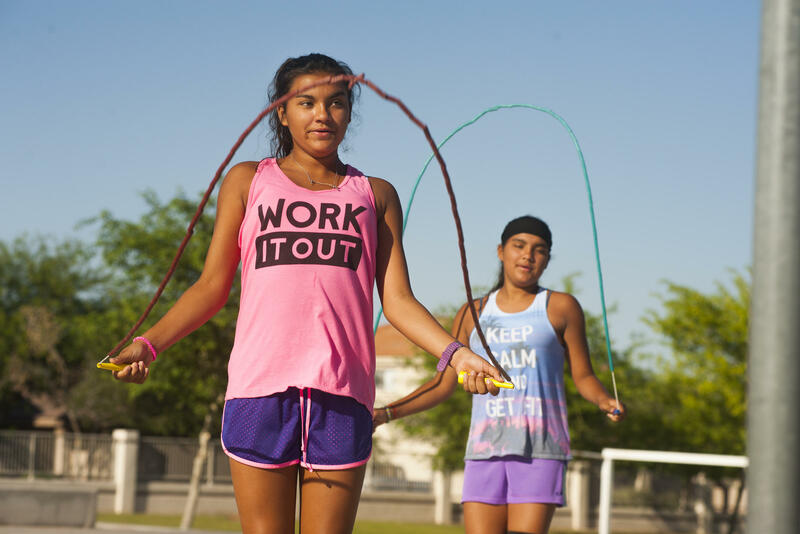 WESTERVELT: For 13-year-old Kaprice Faraci and her twin sister, Kassidy, inspiration to keep moving struck one after-school afternoon in the third grade. Video games bored them, and they were playing outside when they spotted a small group of slightly older girls sweating and puffing down the street. KAPRICE FARACI: We saw some girls running around the school and the neighborhood, and we were like, hey, we want to do that. PRZEOR: So I'm Mindy Przeor, I teach at Brinton Elementary School in Mesa, part of Mesa Public Schools. KAPRICE: She was really encouraging and helped us gain more confidence to be able to run the 5K race at the end of the season. PRZEOR: Looking good, guys. You're at a minute 30. WESTERVELT: Mindy Przeor created her running club because there were no after-school physical programs at the elementary level. A half-hour of PE twice a week just wasn't cutting it, and Arizona has the nation's seventh highest obesity rate for children between 10 and 17 years of age. She's now on a mission to help change that. PRZEOR: Try to awaken the body and get the body healthy so that they are ready to learn. Because sitting in a classroom for eight hours with no activity isn't going to produce the results people are wanting. So it's - we started with about 20 kids and it's just been growing ever since. WESTERVELT: Growing with children such as third-grader Taylor Dugi and her 13-year-old stepbrother, Antonio Conner. He's wearing a T-shirt with a school desk and the words, ancient torture device. Both he and 8-year-old Taylor are now loyal run club members. TAYLOR: It sort of lets me let out my feelings and stuff. After school, I feel angry, and it's on a Thursday, so I just go to the running club. And I just run, and I feel like nobody's telling me what to do. WESTERVELT: Cheap therapy - I love it. On a recent morning, children ranging in ages from 4 to 14 gather at a Mesa high school track at 7 a.m., before the searing Arizona heat sets in. It's first day of the club's summer session. There are warm-up sprints, a quarter-mile time trial, a mile run and grueling stair-climbing drills up and down the metal bleachers. PRZEOR: Go, go, go, go get 'em. It's halfway up. WESTERVELT: Brinton Elementary has a high percentage of low-income students. About 60 percent of the kids here get free or reduced lunch. And Arizona is one of the seven states in the nation with the biggest recent education cuts, including deep trims for non-classroom spending. Voters here have repeatedly refused to raise property taxes to help soften the spending cuts. So another part of Przeor's motivation is that running doesn't cost much - it can be done on your own without a coach, and she says, teaches a lot more than physical skills. PRZEOR: Perseverance and setting goals, and there are so many just life skills that can help you be a successful person that you can gain from an activity like running. WESTERVELT: For a run club, you just need shoes and some space. PRZEOR: Yeah, pretty much. And then the OK from the principal - and my principal thought it was great to do something. WESTERVELT: Przeor knows that one after-school and summer run club won't change the state's childhood obesity rate, but she's now collaborating with other elementary schools, slowly building a running revolution in Arizona, one run club and one race at a time. WESTERVELT: Eric Westervelt, NPR News, Mesa, Ariz. Transcript provided by NPR, Copyright NPR.